This salad was literally inspired by a few ingredients I had leftover on the last day of the recent The Reset retreat that I was catering on. A net of red onions, half a block of feta cheese and a small amount of salad leaves remained in my supplies and I didn’t know what to do with them. I decided to roast the red onions in generous chunks and take it from there. Once the onions had roasted and cooled the remainder of the salad just happened. I’m hugely inspired by colour and a big advocate of eating lots of colourful sources of food. Colour for me lifts my mood, mind and motivation. Use contrasting colours of food in your kitchen and you are sure to get a vibrant dish. A mix of roasted vegetables would also work well if you don’t want to use all onions. Mix the red onions with the oil, pepper and salt in a roasting tin. Once well covered, place in the oven and roast for 25-30 minutes. Remove from the oven and set aside. Place the hazelnuts in a dry frying pan over a medium heat. Toast the hazelnuts until the skin begins to loosen. Remove from the heat and set aside. When you are ready to serve, mix the dressing through the salad leaves with your hands. 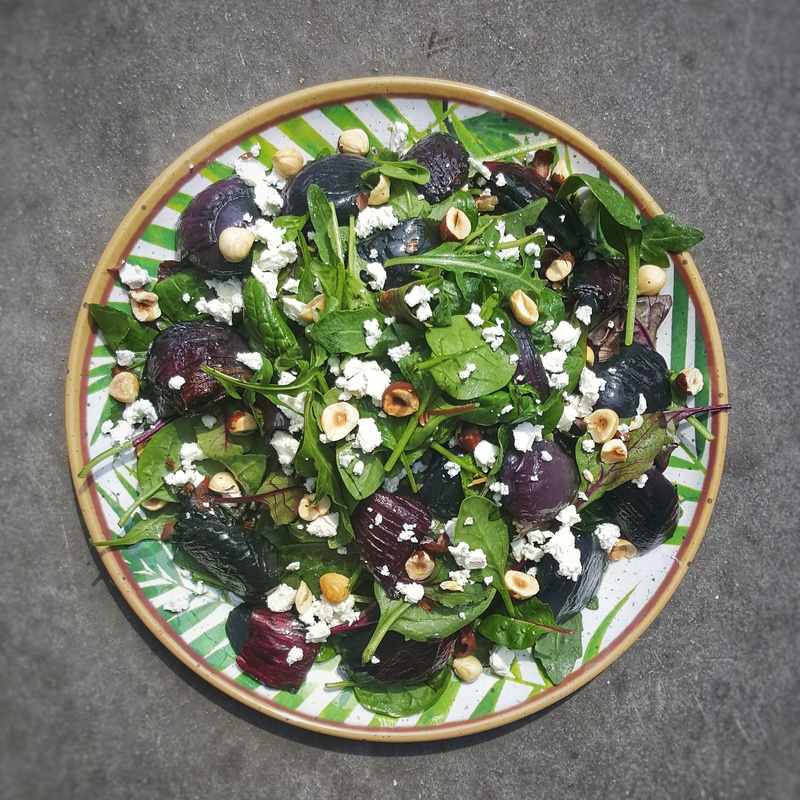 Place half the leaves on the bottom of a serving plate, scatter over half the red onion followed by half the hazelnuts and feta. Add the remaining salad leaves on top, followed by the remaining ingredients.